Twitter left bird droppings all over the First Amendment again after The Daily Caller's Editor in Chief Geoffrey Ingersoll was locked out of his Twitter account Tuesday night for tweeting "learn to code" at an unfunny joke made by The Daily Show. Somehow the Daily Show writers thought it was funny to tweet an 8-second clip noting an "asymmetrical background" when Vice President Mike Pence stood up behind Trump during Tuesday's the State of the Union address while House Speaker Nancy Pelosi remained seated. 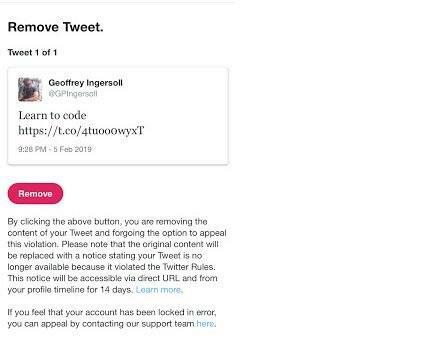 Recognizing the lack of comedic talent, Ingersoll tweeted "Learn to code" - for which he was locked out of his Twitter account. The phrase "learn to code" went viral last month after hundreds of journalists were laid off at the Huffington Post and BuzzFeed. Said outlets notably insulted laid-off middle American coal-miners by recommending they "learn to code" - which 4chan users then turned around on the journalists. Thus, the meme was born. Just days later, with feelings hurt and safe-spaces shattered, Twitter reportedly classified the phrase as "abusive behavior" - before clarifying that it was "more nuanced" than what was reported. just days later, with feelings hurt and safe-spaces shattered, Twitter has reportedly done something about it... "I am told by a person in the know that tweeting "learn to code" at any recently laid off journalist will be treated as "abusive behavior" and is a violation of Twitter's Terms of Service." After Twitter suspended the Daily Caller's Ingersoll, rendering him unable to invade any more safe spaces, Twitter notified the him that he would need to remove the tweet or remain locked out of his account, as he "violated the Twitter rules." Ingersoll appealed the decision shortly after midnight. After the Caller made an inquiry Wednesday morning, Twitter emailed Ingersoll two hours later with an apology - indicating that they had "made an error."